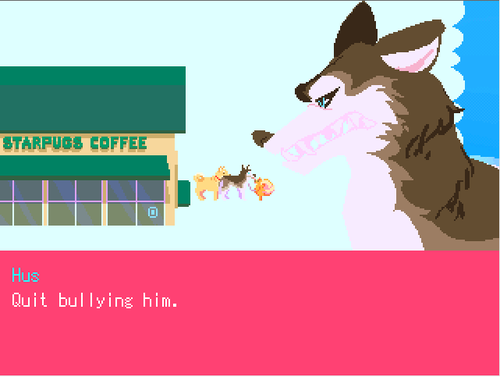 Hus and Shibe are two male characters in Pom Gets Wi-fi implied to have a romantic relationship. Hus is a Siberian Husky and Shibe is a Shiba Inu, transported to dog heaven along with Pom after dying in the same house fire as her. Pom immediately comments on the way the two interact with one another when they meet, comparing their interactions to boys-love anime. Later in the game, Pom, frustrated by her fruitless search for an internet connection, berates Shibe, who is saved by Hus. Shibe blushes and the two run off together, leaving Pom alone. This entry was posted in 2010s, Characters, Gay, Gay (explicit), Queer Men on February 12, 2017 by Adrienne Shaw.